The Waterside Inn provides the perfect meeting space setting for seminars, conferences and corporate retreats. Our peaceful lakeside surroundings afford the focus one requires — without the stress of long distance travel. 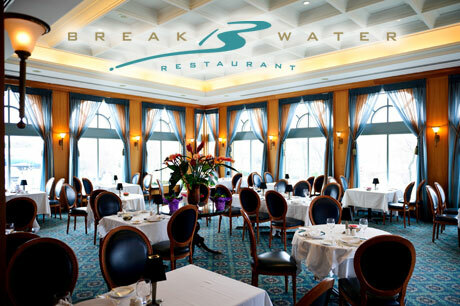 Booking well in advance provides the opportunity to take your meal breaks in the gorgeous surroundings of our award-winning Breakwater Restaurant. Seeing the seasons change through the picture windows of this fabulous restaurant provides a natural setting to take the breaks that recharge a group during a demanding meeting schedule. It’s like a being at a retreat up North without the hassle of long-distance travel! Located in Port Credit, Mississauga’s Village by the Lake—only 20 minutes to downtown Toronto or Pearson International airport—The Waterside Inn offers uniquely designed and fully-equipped meeting rooms. Our executive boardrooms have state-of-the-art audio-visual equipment and we offer complimentary internet connections in each room. The Port Credit Ballroom offers a total of 5,430 square feet and it is divisible into three sections. The room is tastefully decorated in soft aqua colours and each section features an antique crystal chandelier, with an 18′ ceiling and 12′ ceiling height to the lowest portion of each chandelier. The South section features a walkout terrace through three sets of glass doors. The North section also offers natural lighting. The South and North sections each offer electronic blackout curtains and all sections feature electronic drop down screens and audio inputs to the house system. Located close to the ballroom, The River Room offers boardroom seating for up to 12 persons with natural lighting and original artwork. Well-appointed with comfortable seating, the River Room can accommodate 12 people in a boardroom set-up, and 16 classroom or 14 in banquet-style. Located on the 2nd floor of the hotel, the Lakeshore Room offers boardroom seating for up to 10 persons and offers plush, leather high-back chairs. Located next door to the Lakeshore Room, the Hurontario Room offers boardroom seating for up to 10 persons and also offers leather high-back chairs. The Lakeshore and the Hurontario Rooms can be combined to offer boardroom seating for up to 20 persons. Our one and two bedroom penthouse suites are flexible enough to be used as breakout rooms. These suites are well appointed and offer full kitchen facilities along with living and dining rooms and balconies that offer sweeping views of Lake Ontario and/or Port Credit Marina.